Cruden Bay Bed & Breakfast on the scenic Buchan coast, welcomes you home. 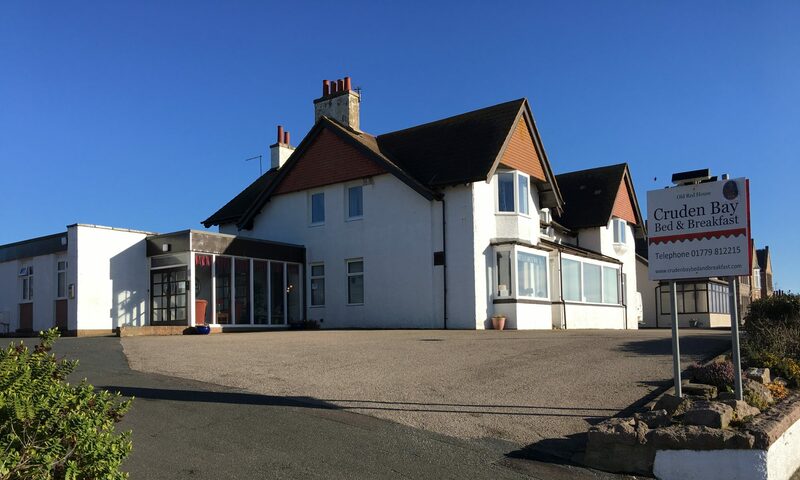 Usually when it’s stated one place is a stones throw from another the claim will turn out to be a bit of an exaggeration, however no such false claim is made when we state our Bed and Breakfast is a stones throw from the world class Cruden Bay Golf Course. It is also perfectly placed as a base for those visiting the North East of Scotland with a mind to play other courses in the area which include Royal Aberdeen and Murcur Links to name but a few favoured by visitors. Cruden Bay is also a wonderful place for hikers and historians. Slains Castle, the inspiration behind Dracula written by Bram Stoker is perched high on a craggy cliff top and overlooks a stunning golden beach which can be easily accessed from the village below. In addition, the village offers a range of dining experiences to satisfy most tastes. The golf club has a superb restaurant and lounge with stunning views across the course. There are also two other restaurants with lounges giving visitors a variety to choose from. Ian, Lorraine and the Devenish Family welcome you to the Cruden Bay Bed & Breakfast, a relaxing and comfortable home on the Northeast of Scotland. We offer spacious en suite accommodation with full Scottish Breakfast year round. Lorraine and I owned and operated the Red House Hotel for over 20 years. During that time we hosted weddings and provided a fine dining experience at Slains Restaurant. In 2014, we transformed the hotel into the Cruden Bay Bed & Breakfast catering to travellers looking for an authentic Scottish experience. We pride ourselves in being a family business and our two children, Michael and Lyndsey, have worked along with us at one time or another. Lyndsey grew up taking golf lessons with her Grandfather, a former captain at the Cruden Bay Golf Course. She went on to represent Scotland as an amateur, winning the Ladies Golf Championship two years consecutively. She played at the University of San Francisco, turned professional in 2003 and played on the Futures Tour 2003-2004. She is currently a PGA instructor at Interbay in Seattle, Washington. Michael has been in the family business from a young age. He attended culinary school and went on to work in the hotel. In 2007, he moved to the U.S. where he earned his helicopter pilot license. In 2013, he moved to Seattle and started working with the Seattle Mariners as Operations Manager of Concessions. He met his fiancee Michelle and in 2015 we welcomed our first grandchild. We are happy to say he and his family have moved back to Scotland to help us run the Bed & Breakfast. We are always pleased to welcome guests from all over the world to Cruden Bay Bed & Breakfast. We hope they will fall in love with the area as many have done before to join our ever growing number of returning guest who have chosen to make this little corner of the Buchan coastline their home away from home. Comfortable accommodation in the heart of the village. Our rooms include En Suite Bathrooms, Free Wi-Fi, Refrigerator, Flatscreen TV and Tea/Coffee Making Facilities. Rates starting at £80 per night for double occupancy and £50 per night for single occupancy. Rates vary seasonally, please check current rates when calling or emailing to confirm availability. Our Bed & Breakfast can also be rented as a self catering holiday home. Please contact us regarding availability and price. By Car: Take the A90 from Aberdeen following signs for Peterhead and Fraserburgh, after about 10 miles turn right onto the A975 towards Newburgh and Cruden Bay. Follow the A975 for 14 miles to Cruden Bay. By Train: The nearest train station is located in Aberdeen. A regular bus service runs from the adjacent train station directly to Cruden Bay which takes approximately 50 minutes. By Plane: Aberdeen Airport is located at Dyce. There is no direct bus route from the airport to Cruden Bay but a regular bus service runs between the airport and bus terminal where buses regularly run to and from Cruden Bay 7 days a week.